In a revolver there is a gap between the barrel and cylinder, and high pressure gas (or plasma) escapes through that gap. 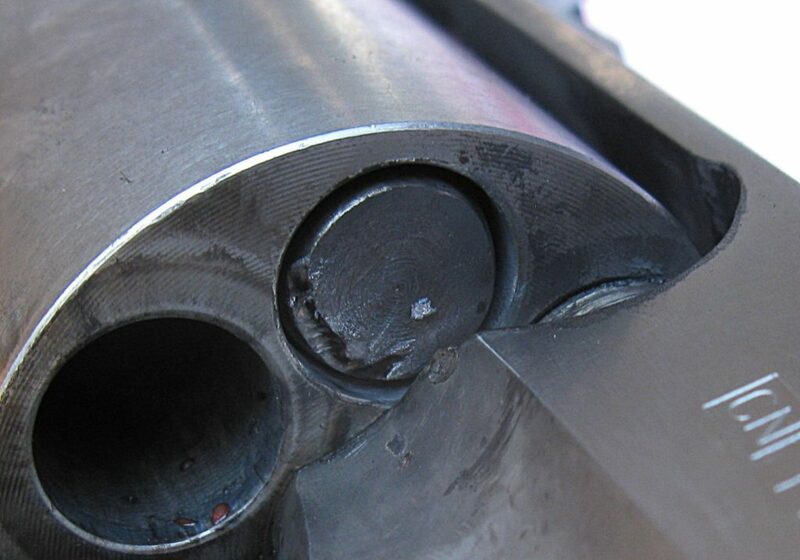 I’ve often heard of “gas cutting” of a modern, magnum revolver frame’s top strap just above the cylinder gap, but I’ve never heard of cylinder gap gas cutting of the bullet you seated way forward, nice and close to the forcing cone. This gun is a “44” caliber (45 by current standards) percussion revolver. The fired chamber in the photo resulted in damage to the bullet noses in the adjacent chambers. Since accuracy depends, among other things, on the bullet’s center of mass being concentric with its spin axis, the damaged bullet is now out of balance and not likely to yield the best accuracy. That is a soft, pure lead bullet in a black powder gun. Smokeless loads produce much higher peak pressure and typically use a correspondingly harder alloy bullet. I’ll assume that gas cutting of cast bullets in a modern revolver is roughly equally likely if the bullet is too close to the cylinder face. Seating the same bullet only slightly farther back behind the cylinder face in the same gun resulted in no apparent gas cutting. Since a black powder load has the bullet packed against the powder charge and lube cookie (if present), the solution is to use a shorter bullet, reduce the powder charge slightly, or use a thinner lube cookie. Another possible solution would be to load only every other chamber and seat the bullets as far out as you wish. For muzzleloader deer season in WA State (and others), a multi shot weapon can have only two chambers loaded anyway, with only one of the two primed, so the latter solution wouldn’t be any kind of compromise in firepower in that circumstance. The reddish droplets you see in the fired chamber consist of bullet lube mixed with black powder fouling. It’s soft, and perfectly normal, and it’s evidence suggesting that the load is sufficiently lubed for fouling mitigation. Anyway, those who load lead or powder coated lead bullets in modern smokeless revolver cartridges might want to know about the possibility of gas cutting of bullets. I could see a hollowpoint being pretty well torn up. Since a heavy magnum smokeless load can cut the good steel of a gun frame over time, who knows; could it even damage a copper jacketed bullet nose? A jacketed soft point? I don’t know. Probably the latter, I’d think. I wasn’t in the habit of inspecting the bullets in adjacent chambers after firing a shot (who is? I’d never heard of “bullet nose cutting” in a revolver as being a thing) so I don’t know how I ended up noticing this. That was months ago. I believe I may have been looking for bullet jump due to recoil, since this was a full load with a new, heavy-ish bullet (no jump was ever observed, FYI). And in case you were going to ask, the cylinder gap in that gun is about three to five thousandths, probably no more than four, or fairly typical for modern guns as well. This entry was posted in Ballistics, Gun Fun, Reloading by Lyle. Bookmark the permalink. If the bullet is out enough to get damaged like that, then its almost out too far to rotate the cylinder. It’s not completely clear from the photo, but I think the bullet is seated back from the front face of the cylinder. So interference with rotation isn’t the issue. The issue, I think, is that turbulent flow around the rim of the chamber lets some of the gases hit the bullet, even though it’s set back from the face of the cylinder. If the bullet weren’t set back some, I’d not have been able to take the shot that did the cutting. Maybe cubby didn’t read the whole text. If we’re going to go back and start over with basic theory, then the point of the post is lost. Yes, the bullet in the photo is seated behind the cylinder face by near a sixteenth inch. I didn’t measure the exact distance, but that’s not the point as the required distance off the cylinder face for avoiding bullet cutting would no doubt vary from one gun, or caliber, or bullet type, to the next. The only point was to introduce the concept of the cutting of bullets in adjacent chambers from cylinder gap blast. Maybe you all have heard about it and seen it yourselves, but I’ve been shooting, and have read millions of words about shooting, over some decades and I’d never heard of it. It certainly was new to me, not that I’m all that well read about shooting. Thanks Lyle. That is a fascinating photo.